The Thick SuperGrip Card Holders are designed with a permanent adhesive which keeps them firmly in place. The sign holders will be able to hold thicker cards for a more sturdy display. What material thickness can they accept? 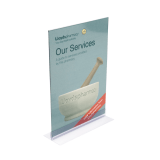 The SuperGrip card display can hold material up to 4mm thick. 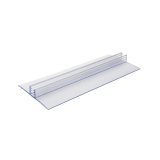 The SuperGrip sign holders are supplied in packs of 100. What is the size of the card holders? The base measures 2cm, and there are two lengths available; 7.5cm or 15cm.